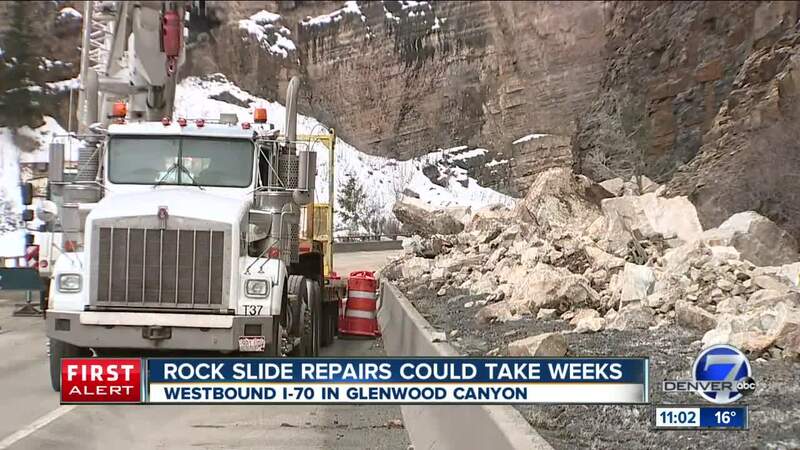 One lane is still closed on I-70 after yesterday's rockslide in Glenwood Canyon. No drivers were caught in the slide. 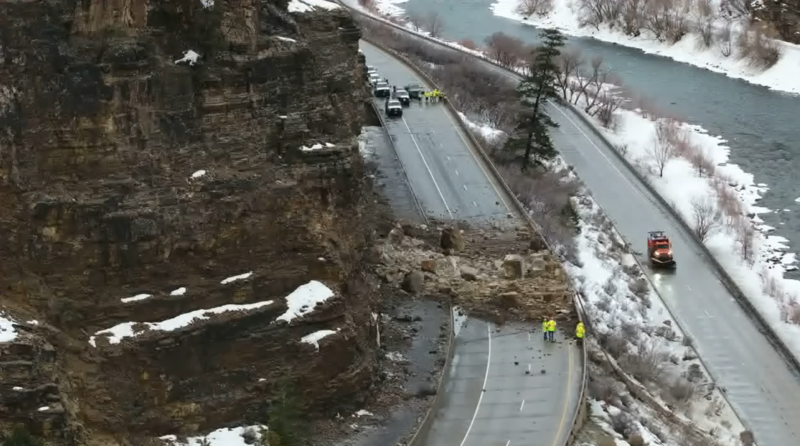 GLENWOOD SPRINGS, Colo. — Interstate 70 in Glenwood Canyon was closed Tuesday morning in both directions due to a large rock slide, but the Colorado Department of Transportation reopened the eastbound lanes just before 6:30 p.m. and opened one westbound lane Tuesday night. The slide happened around 1 a.m. Tuesday just west of the Grizzly Creek rest area, according to Tracy Trulove with CDOT. Crews with CDOT told Denver7 that three of the rocks are the size of Suburbans and that the total amount of rock could fill between 25 and 30 dump trucks. Some of the larger boulders will be broken down and reused for other projects. Crews worked through the day Tuesday to determine the extent of the damage. "The wall on the westbound side of the bridge deck was damaged," Trulove said. Westbound I-70 is closed at exit 133/Dotsero and the eastbound lanes were closed at Exit 116 in Glenwood Springs. Semi drivers are being asked to stage at the Dotsero Truck Parking. CDOT said that there were no holes punched in the road or bridge deck like has happened in the past. There is no rock fall fence in the area because of the steep grades of the mountainsides. As of 11:30 a.m., the eastbound lanes of the road were open but they are expected to close again Tuesday afternoon for further rock mitigation efforts. But they were closed again around 3:30 p.m. for more rock mitigation. In a 4 p.m. conference call, CDOT said engineers were discussing ways to see if they can reopen the interstate safely and how soon they can do so. There were no updates as to when the eastbound lanes would reopen after the mitigation is complete, nor when the westbound lanes would reopen. CDOT is also concerned about an incoming snow storm that could affect their ability to minimize the risk of more rocks falling, a spokesperson said in the conference call. Just before 6:30 p.m., the eastbound lanes of the interstate reopened, but the westbound lanes remained closed. One westbound lane is expected to reopen Tuesday night, however, CDOT said. 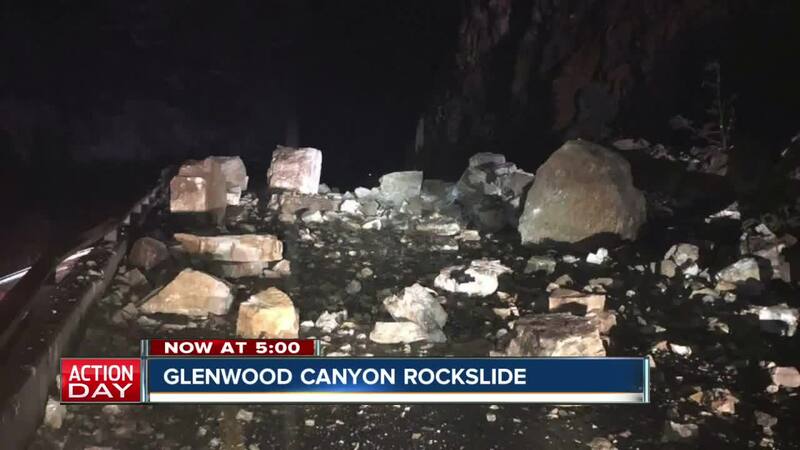 There have been several large rock slides in Glenwood Canyon. In February 2016, falling boulders punched huge holes in the interstate, which stayed closed for several days. Highway 131 (Wolcott) to Steamboat Springs, west of U.S. 40 to Craig and then south to Highway 13 to Rifle and back on I-70 is the best alternative route for westbound motorists as of Tuesday morning. 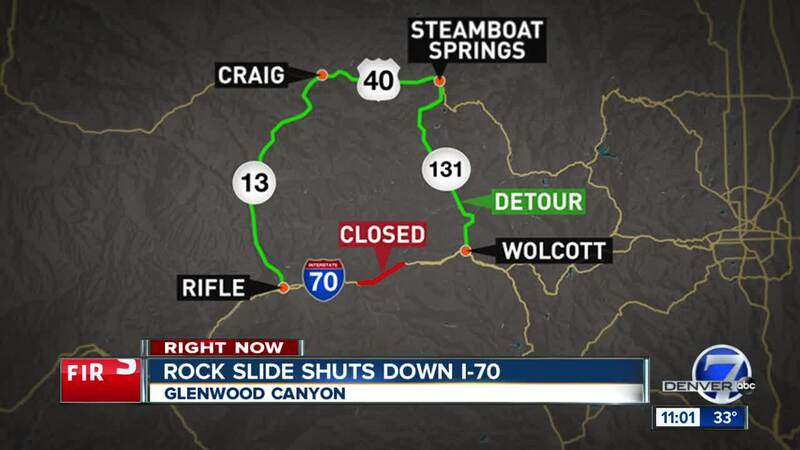 This detour adds 146 miles and about three hours to a regular trip from Wolcott to Rifle on I-70, which is normally 67 miles or about 45 minutes, according to CDOT. Cottonwood and Independence Passes are not an option because they are closed for the winter.